ISGPP-West Bengal | Ank aha! The project covers all the 3,342 Gram Panchayats across the 19 districts of West Bengal as part of the ISGPP Phase II. 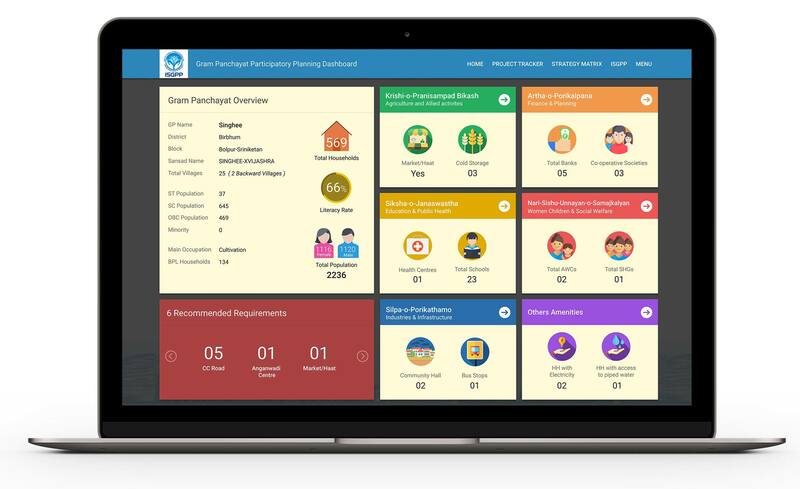 As part of Institutional Strengthening of Gram Panchayats Project (ISGPP) of the Government of West Bengal, the Ank Aha team developed a tool would result in improved local governance, better decision-making and project tracking. This was done by leveraging various visualizations and training local community members/officials about the use of the tool. The aim of the project was to develop institutional mechanisms to enable the GPs to optimally utilize the increased untied funds coming from the Centre and State Finance Commissions, by managing resources in an efficient manner and delivering services effectively. Given that West Bengal has witnessed complete devolution of power to local bodies, the gram panchayats in West Bengal have a large quantum of untied funds. These funds needed to be allocated efficiently, based on the needs of these areas. This required better planning and monitoring of projects. The team then prepared a 3-stage process: Planning, Tracking, and Monitoring. Planning focused on mapping the village amenities across different sectors. The Tracking phase focused on identifying the key gaps across different sectors/thematic areas as well as providing knowledge support for program implementation. Monitoring focused on continuous follow-ups on each project to ensure targets were being met. Very specific activities can be undertaken by leveraging the untied funds available under the 14th CFC and 4th SFC. Therefore, the tool had a strategy matrix component, which would contain detailed information on the specific provisions of the sector-specific central and state government schemes so that the PRI functionaries can optimally utilize it for decision-making and project development. The project covers all the 3,342 Gram Panchayats across the 19 districts of the state as part of the ISGPP Phase II. Today, the dashboard is ready and has been deployed for use under the ISGPP. The team was able to successfully deliver the project in 3 months.